Here’s how you had to do it earlier – Boot your Mac into Recovery Mode, go to Disk Utility, then erase your drive, followed by re-partition. Finally, reinstall the OS. 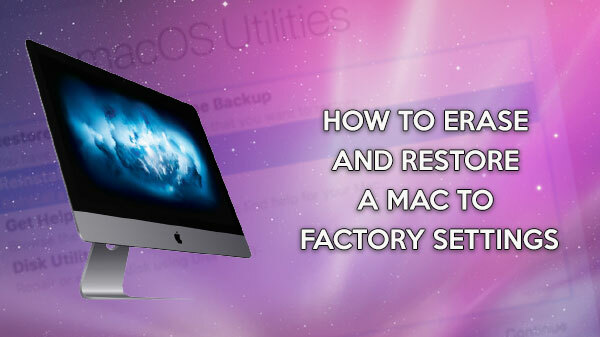 Previous versions of macOS had this almost endless process of restoring your Mac to its factory settings. Certain points to keep in mind. Your Mac must be running an OS High Sierra 10.13.4 or higher. The feature ‘–eraseinstall’ was introduced in High Sierra. Alongside this, ensure that your hard drive is APFS formatted. Re-partition might not be possible otherwise. Within the downloaded installer, you’ll find a command called ‘startsosintall’ under which you’ll find ‘–eraseinstall.’ To view this, you’ll have to open the installer through Ctrl+Click, and not a regular click. Go to Show Package contents > Resources. You’ll find ‘startsosintall’, open Terminal and drag this command onto the window. Type ‘–usage’ at the end of the command and press Return. You’ll be able to view a list of several options. Some of them are ‘–agreetolicense’, ‘–eraseinstall’, ‘–newvolumename.’ Each one has a special function, either to agree to the end-user license, erases the volume, and changes the name of the new volume. After hitting Return, the command ‘startostall’ will do the rest. From the next boot, it’ll be a fresh new macOS. You can restore your previous file and data from Time Machine and from where you’ve stored them.